A book is a magical thing. Black marks on white paper create words; words conjure worlds. But the sorcery of Watership Down is remarkable even by literary standards. The world conjured here defies expectation and suspends disbelief. 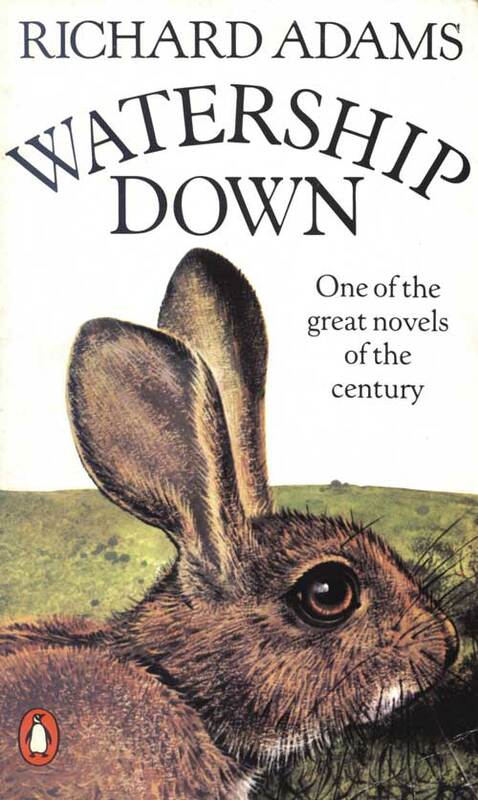 Richard Adams took a seemingly ludicrous subject – the adventures of a group of rabbits – and made it something that could grip the imagination and stir the emotions of readers at any age. He did this by combining two distinct traditions of writing about animals: the realism of Jack London’s Call of the Wild (1903) and White Fang (1906) with the fantasy of Wind in the Willows (1908) and Beatrix Potter (1866-1943). Jack London’s animals are real and don’t speak, but Grahame and Potter turned animals into miniature humans, bringing them into our world, taming and civilizing them. Adams does the reverse: he takes us into the world of animals. He kept his rabbits wild and on all fours, sworn to the sward that they create with their teeth, but he used one piece of anthropomorphism. Hazel, Fiver, Bigwig and the other rabbits can all talk. They have a language, Lapine, and communicate with other animals using a “very simple, limited lingua franca of the hedgerow and woodland” (Part II, ch. 20). At the beginning of the book, Fiver is the unacknowledged shaman of Sandleford Warren and foresees the doom that approaches it. Unfortunately, few rabbits believe him, which is why Adams heads the first chapter with a quote from Aeschylus, Cassandra’s warning that “The house reeks of death and dripping blood.” Every other chapter has its apposite quote, ancient or modern, poetry or prose, whimsical or serious: Aeschylus, Shakespeare, Tennyson, Napoleon, W.H. Auden, Dr Johnson, Clausewitz, Walter de la Mare and so on. The quotes stitch Watership Down deftly into the literary canon and into history, because the book is, in part, a celebration of story-telling and the possibilities of language. But I think Adams is more linguistically creative and subtle than Tolkien, whose invented languages still seem like real ones: Welsh, Finnish, Old Norse and so on. Lapine isn’t reminiscent of anything familiar and some of its words – pfeffa, “cat”, and hrududu, “motor vehicle” – are cleverly simple, just the sort of onomatopoeias you can imagine a talking rabbit would use. Lapine is also like Nadsat, the teen-speak invented by Anthony Burgess for A Clockwork Orange (1962). Adams leaves some words of Lapine untranslated at first, letting context give them meaning, sprinkling them through the text and allowing them to sink slowly into the reader’s mind. By the end of the book, you’ll find that you can understand basic Lapine: “Siflay hraka, u embleer rah,” says Bigwig to General Woundwort and the line doesn’t need translation. General Woundwort is the Polyphemus or Sauron of Watership Down: a rabbit almost as big as a hare, the cunning and vicious megalomaniac who leads the slave-warren Efrafra. His wickedness is on a much smaller scale than Sauron’s, of course, but that makes it more credible and so more powerful. Lord of the Rings is more ambitious than The Hobbit, which is admirable, but also less successful, which was inevitable. Bilbo sets out to slay a dragon, not save the world. The rabbits in Watership Down are unwilling refugees who want to found a permanent warren of their own. It’s a small thing within the wider world, where humans rear giant metal pylons, span rivers with bridges, and speed to and fro in hrududim, but then human affairs are small within the wider universe. That’s describing a raid on a farm that keeps pet rabbits. Hazel wants to find some does for the warren at Watership Down, where he and his fellow hlessil – “wanderers, scratchers, vagabonds” – seem to have finally found sanctuary. They’ve come a long way through strange country, but they’ll go further and see stranger before the end of the book. 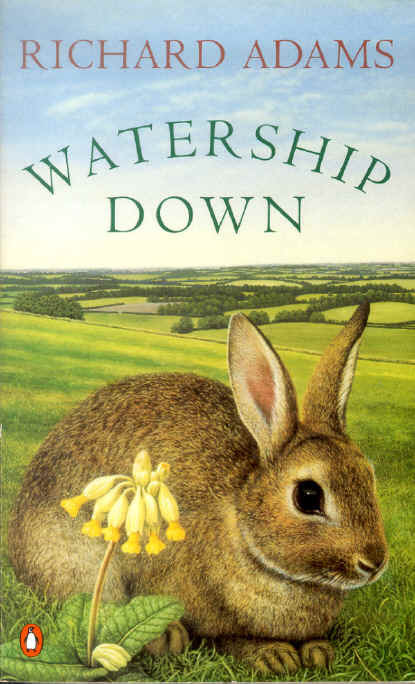 Watership Down is first and foremost an adventure story, but it’s also a celebration of the English countryside: its flowers, trees, birds, streams and rivers; its sounds, scents, shapes; its delights and dangers. The rabbits have their place there, naming themselves from nature, and unlike man, with his stinks and cacophonies, they don’t desire dominion over it. The raucous gull Kehaar, their ally in their struggle with General Woundwort and Efrafra, brings word of far-off places and the mysterious sea, but their world is room enough. It fills their senses, challenges their cunning and ingenuity, sustains them, in the end will slay them. The countryside is the biggest character, as the title suggests, and rabbits were the best way to bring that character into a book. They’re social animals, mostly warren-dwelling, occasionally wandering, and if Adams could suspend disbelief and give them language, he could conjure a world of wonders through their eyes, ears, noses and mouths. Thanatic fanatic. Say it. Savour it, if you’re that way inclined. I certainly am: I am obsessed with words. The sound of them, the shape of them, their history, meaning and flavours. If I were a Guardianista, I’d say I was “passionate about” words. But it’s partly because I’m obsessed with words that I’m not a Guardianista. The Guardian and its readers use them badly. I like people who use them well: A.E. Housman and Clark Ashton Smith, for example. AEH (1859-1936) was an English classicist, CAS (1893-1961) a Californian jack-of-all-trades. But they were both masters of the English language. Fast by the four cross ways. The dead man stood on air. To men that die at morn. Than most that sleep outside. Than strangling in a string. As treads upon the land. *Hanging in chains was called keeping sheep by moonlight. Should charge the land with snow. The hedgerows heaped with may. That will not shower on me. “Look well,” said the necromancer, “on the empire that was yours, but shall be yours no longer.” Then, with arms outstretched toward the sunset, he called aloud the twelve names that were perdition to utter, and after them the tremendous invocation: Gna padambis devompra thungis furidor avoragomon. Instantly, it seemed that great ebon clouds of thunder beetled against the sun. Lining the horizon, the clouds took the form of colossal monsters with heads and members somewhat resembling those of stallions. Rearing terribly, they trod down the sun like an extinguished ember; and racing as if in some hippodrome of Titans, they rose higher and vaster, coming towards Ummaos. Deep, calamitous rumblings preceded them, and the earth shook visibly, till Zotulla saw that these were not immaterial clouds, but actual living forms that had come forth to tread the world in macrocosmic vastness. Throwing their shadows for many leagues before them, the coursers charged as if devil-ridden into Xylac, and their feet descended like falling mountain crags upon far oases and towns of the outer wastes. Like a many-turreted storm they came, and it seemed that the world shrank gulfward, tilting beneath the weight. Still as a man enchanted into marble, Zotulla stood and beheld the ruining that was wrought on his empire. And closer drew the gigantic stallions, racing with inconceivable speed, and louder was the thundering of their footfalls, that now began to blot the green fields and fruited orchards lying for many miles to the west of Ummaos. And the shadow of the stallions climbed like an evil gloom of eclipse, till it covered Ummaos; and looking up, the emperor saw their eyes halfway between earth and zenith, like baleful suns that glare down from soaring cumuli. And seas between the twain. You know no more than I. And thick on Severn snow the leaves. But then it threshed another wood. The thoughts that hurt him, they were there. Then ’twas the Roman, now ’tis I. By the word of masterdom. That you howl and hunger for. Do the deed I bid you do. Which incubi and lovers burn to do. Creaming with a winy foam, full of strange murmurous voices and vague tales of exotic things, the halcyon sea was about the voyagers now beneath the high-lifting summer sun. But the sea’s enchanted voices and its long languorous, immeasurable cradling could not soothe the sorrow of Fulbra; and in his heart a despair abided, black as the gem that was set in the red ring of Vemdeez. Howbeit, he held the great helm of the ebon barge, and steered as straightly as he could by the sun toward Cyntrom. The amber sail was taut with the favoring wind; and the barge sped onward all that day, cleaving the amaranth waters with its dark prow that reared in the carven form of an ebony goddess. And when the night came with familiar austral stars, Fulbra was able to correct such errors as he had made in reckoning the course. “The Isle of Torturers” (1933). In The Dead Will Cuckold You, the poetry never escapes the putridity. After reading it, you will understand why L. Sprague de Camp remarked this of Smith: “Nobody since Poe has so loved a well-rotted corpse” (Literary Swordsmen and Sorcerers: the Makers of Heroic Fantasy, Arkham House 1976, pg. 206). Nor has anyone since Poe so loved an ingenious torture: in Scene V of the play, King Smaragd threatens his guards with a “douche” of “boiling camel-stale”. There’s humour in Smith’s morbidity, but I think that he dwelt too long on unhealthy themes. It shows both in his stories and in his popularity: the Weird Tales Big Three, H.P. Lovecraft (1890-1937), Robert E. Howard (1906-36), and Clark Ashton Smith, are rather like the three stars in the belt of Orion. Lovecraft and Howard are bright Alnilam and Mintaka, Smith is dimmer Alnitak. His luxuriant lexicon explains part of this, but his necrocentric narratives must repel people too. Housman wrote about death more delicately and distantly. His work doesn’t so much narrativize the necrotic as thematicize the thanatic. It talks about dying, not decaying, and it doesn’t relish the repellent as Smith’s work often did. This helps explain why Housman is a bigger name in English literature than Smith, though I don’t think he was a greater writer. Housman is a minor poet with a major name. I think he deserves it for the beauty and simplicity of his verse. He’s a word-magician who can conjure tears. Smith is a word-magician who can conjure titans. He did more with English and deserves some of Housman’s fame. With his poetry, he might have won it; with his putridity, he lost his chance.